Representative Honours: Northern Ireland: 30 Full Caps/1 Goal (1988-1994), 3 ‘B’ Caps (1994-1999), 1 Under-23 Cap (1989), 1 Under-21 Cap (1990); England: 4 Under-18 Schoolboy Caps (1986). Club Honours: (with Luton Town) Football League Cup Winner 1987/88, Runner-Up 1988/89; (with Nottingham Forest) Football League Division One Runner-Up 1993/94; Football League Cup Runner-Up 1991/92; Football League Full Members Cup Winner 1991/92; (with Grimsby Town) Football League Division Two Play-Off Winner 1997/98; Football League Trophy 1997/98. The controversy stirred up by Kingsley Black’s decision to play for Northern Ireland, instead of his native England, saw the then largely unknown winger splashed all over the back page of every national and local newspaper. Having already played for England schoolboys Black had been offered a chance to play for their Under-21 side, but he chose instead to play for Northern Ireland, the country of his father’s birth. He made an impressive international debut, as a nineteen year-old, against France in April 1988, and was a regular in the team for the remainder of Billy Bingham’s management. Black, whose father came from Castlerock in Co. Londonderry, joined his local club, Luton Town, as an apprentice, signing professional forms in July 1986. He went on to star for them in their 1988 League Cup win, and just three days later he made his Northern Ireland debut. His wing trickery, either left or right, and pace when running with the ball saw him become a much sought after talent. A protracted £1.5million move to Nottingham Forest was completed in September 1991, and Black quickly fitted into Brian Clough’s impressive young side, noted for its quick passing and skilful football. Soon however the move turned sour as Black fell out with Clough. His career was under a cloud, Black found himself on the transfer-list just months after his dream move, though his first season did end with two Wembley appearances. Black scored the winner in Forest's 3-2 ZDS Cup Final vitory over Southampton, but a fortnight later he found himself on the wrong end of a 1-0 scoreline in the Rumbelows Cup Final match-up with Manchester United. 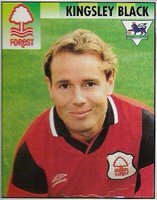 The following season, with Black in-and-out of the side, Forest's form dipped alarmingly - they finished bottom and were relegated from the Premier League at the end of the 1992/93 season. Following Clough’s departure from the City Ground that summer Black returned to favour with new manger Frank Clarke and Forest stormed to promotion at the first attempt. However, the emerging forces of other Forest wingers, Steve Stone and Ian Woan, were again threatening Black’s club career, he looked lightweight in comparison. In the following seasons Black again fell by the wayside as both Bryan Hamilton and Frank Clarke rebuilt their teams for the challenges ahead. He had never really transferred his club-form to the international stage, and his final cap was won against Romania in March 1994 and it seemed he was just playing out time at Forest until his contract ran-out as he spent his time either on the bench or on loan. A cut-price £25,000 move to Grimsby Town during the 1996 close season saw Black’s fortunes improve, and B caps followed, against Norway (in 1996) and Wales (in 1999), but he was unable to break back into a Northern Ireland team featuring an impressive array of wingers such as Gillespie, Hughes, McMahon and McCarthy. An Auto-Windscreen Shield winner’s medal was added to Black’s collection as he starred in Grimsby’s 2-1 extra-time victory over Bournemouth. Black ended his playing career with a spell at Lincoln City, retiring in October 2002. He settled back in the Luton area, returning to the Hatters in 2016 as part of their education programme's coaching staff. Summary: 22(8)/1. Won 7, Drew 9, Lost 14. I was at the France game when Kingsley made his debut.